Several weeks ago I kneeled with a lantern on the prow of a friend’s skiff as we motored downstream to our musky basecamp deep in Michigan’s Upper Peninsula. It was a pitch-black Northwoods October night, and the precipitation falling from the sky seemed to change from rain to sleet to snow and back to rain again with each river bend. The plan had been to make camp, where two other musky hunters waited, before nightfall, but that plan was now clearly out the window. But we had whiskey to lighten our mood and a lantern to light up the bank and by the half-way point I realized that part of the reason I loved musky fishing was that it takes place so far away from your everyday life. In different circumstances that realization could have been met with concern, but I felt nothing but excitement knowing we’d be at a remote camp many river miles from the nearest access point. A good part of this feeling of ease came from knowing the tools I had brought would ensure the trip was efficient, effective and survivable. Here’s a list of items that will ensure a successful fall musky expedition wherever you may find yourself. 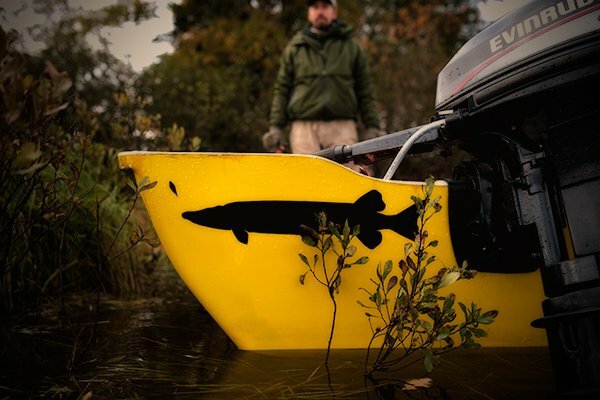 Any musky adventure begins with flies—big flies—and big flies begin with big hooks. There are several great options out there, each with a slightly different application. In the very simplest terms, you want the head of your Esox fly to push, and the tail of your fly to kick—the physics is the same as in a Kelly Galloup or Tom Lynch streamer. But because musky hooks are so big, the style of hook you use can seriously effect the action and behavior of the fly. Tiemco’s 600SP is a meaty, wide-gap hook, best suited to forming the head of the fly. The over-sized hook gap ensures that your head will not compromise the hook’s initial sticking ability. Its weight will also provide some motivation for that buoyant head of the fly to get to the business side of the meniscus. Most actionable size: 6/0. Another great hook for the heads of those bigger flies is Gamakatsu’s Heavy Cover Worm Hook. It’s a hook originally designed for largemouth bass anglers, so you’ll have to either remove or work around the wire worm keeper. A quick yank of the pliers frees up the shank in no time. It’s a good musky tool in sizes 4/0 and 5/0. This hook runs big. Lastly, Partridge of Redditch makes a great new hook called the Predator X, a wide-gap micro-barbed number well suited to the bodies of articulated flies and the heads of all-but-behemoth concoctions. This is a hook that, in smaller sizes, makes a great big trout hook. It runs a bit small for its size compared to the above two hooks. 8/0 is good for forming the heads of flies; 4/0 and 6/0 make a good-sized mid-section hook. While we’re talking hooks, it’s worth mentioning a relatively new product developed by new-age material maven Greg Senyo. His Predator Wrap allows you to endow your flies more body without the water-holding weight. I like to mix it in between applications of deer hair. In addition to bulk, it also brings some glitter and glam into the equation. Use it any time you’re tying a pattern in the round and want to add mass without sog, whether that be for musky, trout, steelhead or smallmouth. Maybe it’s the fact that their two locations in Michigan and Minnesota border so much great musky water, but I really like what Scientific Anglers continues to produce for the musky angler. My classic standby has been their Wet Tip Express series. It’s a 25-foot head that turns over big flies and gets them underwater, and it’s supple core makes it a phenomenal cold weather line (I used it all through last winter’s Polar Vortex). If you’re new to throwing heavy lines like these, understand that they exist not so much to plumb the depths than to counter the natural buoyancy of an articulated deer hair fly. Depending on your rod angle, speed of strip and size of fly, you can still wake a fly just subsurface with a 450 grain head, which is your best all-around fall to early winter musky line. For slower water, or water with a lot of timber, Scientific Anglers is introducing a new intermediate line based on their popular Titan Taper series. I spoke with R&D Manager Andrew Bosway, who said the Titan Intermediate (due to become available next week) emerged from a natural need in the streamer community. “A lot of guys were using the Titan Taper floating line for delivering their bigger, heavier smallmouth and trout flies. We wanted to maintain its ability to launch big and unwieldy flies while allowed for a more aggressive sink rate than a floating line.” With its short, compact head and thin running line this line is absolutely awesome to cast. Its slower sink rate makes it a great choice for “soaking” flies around structure, occasions where pausing for long moments near cover would get you in trouble with a heavier line. It would also make a superb summer musky line. Rigging one rod up with a Wet Tip and the other with a Titan means you’ve got covered the entire water column covered. But what’s going to throw all that? This is, perhaps, the most important question the musky angler faces, since no one casts such large flies with such insane frequency as the musky hunter. When it comes to fall and winter fishing, an 11-weight rod will make throwing those larger articulated flies a much more enjoyable proposition. My go-to cold weather musky rod is the much bigger brother of my go-to summer trout rod, the Orvis Helios II Tip Flex. What the Helios II brings to the equation is lightness, line speed, launchability and strength. Put simply, faster musky rods minimize the number of false casts you’ll need to get the requisite line speed to launch your muppet to the bank. Minimizing false casts means your flies are in the water more often and your shoulder is doing less work day in and day out. Another musky-friendly element of the Helios II is its oversized extended cork handle—essentialy another full-sized full-wells grip stacked on top of your first grip. While originally designed for applying extra leverage to pelagic fish, this extended cork handle gives you much needed rod control when either figure-eighting or depth-charge retrieving–those occasions when you want to keep your fly ticking the bottom in deep water. Having your hand further up the blank gives you a lot more leverage whenever those awkward angles are concerned. The successful musky angler leverages all advantages. Late fall in the North Country means early cold and ample darkness, so I’ll round out this list of muskified materials with a few neat light sources equally well suited to fall musky and cold weather steelhead. First and foremost, I didn’t know it was possibly to get excited about a flashlight until I met the ExtremeBeam XT8. All you, I or anyone else can say is: wow. And then you say it again. The XT8 is a rugged, waterproof, compact (about the size of your hand) flashlight that flings back the dark further than anything else in its class. It’s focused beam is so penetrating it will really change the way you think about the fishing at night. I have never moved around with such ease and confidence in the gloom. It has three brightness modes, a flash mode for signaling, and an S.O.S. flash mode for emergency signaling. It would make a great Christmas gift. I can’t wait to use it for summer mousing as well. On the other end of the light spectrum, sometimes its nice to have a serious diffused light source not attached to your head or hands, something to drop onto the pier of a pitch-black boat ramp or hang above you as you split wood for a campfire. Coleman’s latest line of products, from coolers to stoves, are a departure from the Coleman norm. They’re not that beautiful ugly green of yore. They’re built to rival specialty products from more niche manufacturers. I’ve been particularly pleased by the performance of their CPX 6 lantern. With its 1000 lumens it casts a sphere of daylight up to 60 feet around its 5 LED bulbs. I accidentally left mine out in a heavy October rain upside down and can attest to its durability. And yes, if you find yourself three hours late and chugging through the darkness of a wet and weary October or November night, this lantern will help you out there as well.